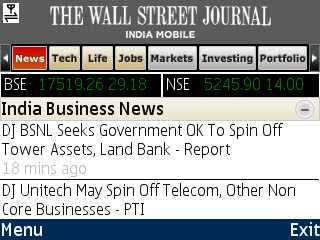 Lab Report: WSJ India Mobile Application. The Very First product I reviewed on Lab Report was NewsHunt . A Mobile application for accessing feeds of your favourite news paper on mobile phone.News hunt belong to a category of News product which is in the business of aggregating news from various sources. There is another HUGE category in News applications for Mobile Phones .That is of Application for a specific Newspaper. The differentiation is Intuitive because after a while reader develops a taste for a specific news paper and stick to it. So I was pleasantly surprised to see that one of my favorite News source WSJ has launched its Mobile Application in India .WSJ content was one reason I subscribed to HT Mint . So I Installed the app on my Nokia E63 the moment I read about it on Medianama and spent much of last evening playing around with it. 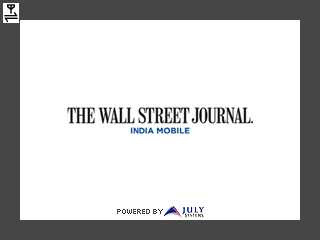 WSJ India is a JAVA application developed by Bangalore based July Systems .Its supported for BlackBerry devices, Nokia N Series, E Series and majority of Nokia Smart phones. you can download it by pointing your mobile phone browser to http://www.wsj.com/indiamobile. Application is of 329Kb in size.it took me couple of minute to download it over GPRS.On Installation user is asked to connect to Internet using "Airtel Live" APN .After a lag of couple of sec while application fetched content I was on welcome screen. Home page of APP is organized around Tabs,each tab is dedicated to a news category . There are tabs for Tech, Life,Jobs,Market,Investing,Portfolio etc.You can switch between tabs using right and left scroll keys.In most of the tabs they have placed an banner advertisement right at the top This advertisement is followed by a stock ticker showing latest value of BSE and NSE Index. Immediately below the Stock index there is an expandable listing of subcategories. You can view link to stories in each of these sub sections by clicking on the "+" icon on the Right hand side of each listing. On clicking the link it shows the story.Content in Most of the tabs is of WSJ India's own.However in some categories they have collaborated with external partners.For example their job listings are powered by Naukri. In some sections like Portfolio you need to subscribe to get access to the premium content. WSJ India Mobile App is a decently designed application . Their choice of going with a TAB based interface affirm my hypothesis that tab is the appropriate schema for information display on mobile. Most interesting aspect of WSJ app is their placement of banner advertisements inside the application. For instance you will find a different banner in every tab .They have placed Ad banner at the start of every Tab and just before Stock Ticker. This arrangement solves one of the biggest problem in any sort of advertisement . The problem of ensuring that your ad get noticed and registered by your audience.Now think of yourself as a high end Business person with WSJ App on your blackberry. what information you would like to track most ? where on the app screen are you are most most like to glance repeatedly? Stock Market Index of course . so there you have stock ticker in EVERY Tab. Now since Advertiser want to place Ad where they get maximum eye balls .Bingo! !So you have "Ad Banner"right on the top of stock ticker. UI Designer has done a nice job of ensuring that ad banner don't look intrusive. Another aspect of ad optimization is evident in listing of Sub section in every tab.Usually in News application you find Top Category ,Sub section and Stories available in three separate pages. Ensuring three page views and creating opportunity to serve three ad impressions. However with slow GPRS this can be a UX nightmare at times. In WSJ India APP this navigation is of One pages only as Both Top Categories (TAB) , Subcategory (section list in tab ) and listing ( link to stories) are in same page . Their premium subscription is priced at Rs 99/Month . How many user will opt For it is yet to be seen . In US and other market News papers have tied their mobile offering with a Yearly subscription of their print offering .Any such offering will greatly enhance its appeal for masses. Nevertheless for its Targeted customer base WSJ looks like a good value proposition . Do try it out and let me know how you feel about it ? Why not just access http://m.asia.wsj.com with the Airtel Live APN? Thanks a lot for writing about useful review. It must to understand that mobile apps development could help in your business by installing custom development software apps. Also you may turn your attention on outsource enterprise content management software. i would like to know more features about BlackBerry devices. It's well done info. Let me mention about home insurance quotes provided by homeowners protection companies. Compare free rates on homeowners insurance. Thank you for posting this useful review. You have affordable chance to check casino affiliate programs. The best gaming programs such as affiliates united partners and great poker rooms such as party partners. Good review on mobile application. I will continuously read your useful posts. Mobile app development demands each and every platform to be unique and must showcase numerous attributes, therefore creating it bothersome.